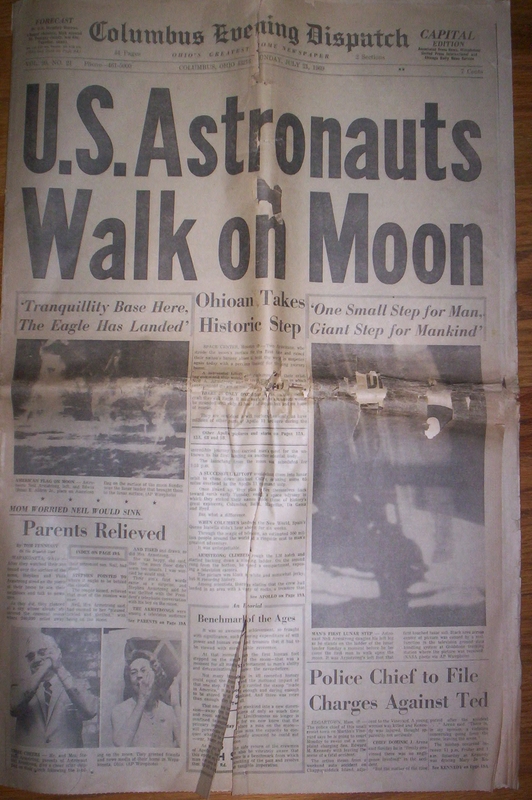 I’ve had this July 21, 1969 edition of The Columbus Evening Dispatch since I was a kid. I think my grandma gave it to me when my Star Wars fandom gave birth to my fascination with real-life space travel and astronomy. While I was getting the paper out for a revisit around the 40th anniversary of the Apollo 11 moon landing, though, I also found part of an amazing Detroit Free Press special section dated Sunday, July 13, 1969. Its full-color front and back pages – I only have the outermost pages which wrapped the section: 1,2, 15 and 16 – blew me away, and I can’t’ imagine what this must have cost to produce 40 years ago, especially since even when I was growing up in the 1970s and early 80s, seeing a color photo in a newspaper was still a relatively rare and eye-catching thing. You really want to see this in the big version. Click on it. Frail man sails a silvery bug into space this week, riding his faith and audacity across 240,000 dark and empty miles to leave his footprints on the moon. High above the moon’s surface, astronaut Mike Collins will circle in the command module, waiting for rendezvous. He will be able to talk to Armstrong and Aldrin,to see their ship, to hear a distress call if that call should come, but no more. When the lunar module Eagle drops within 35,000 feet of the moon, Collins cannot follow. It is impossible for him to land. 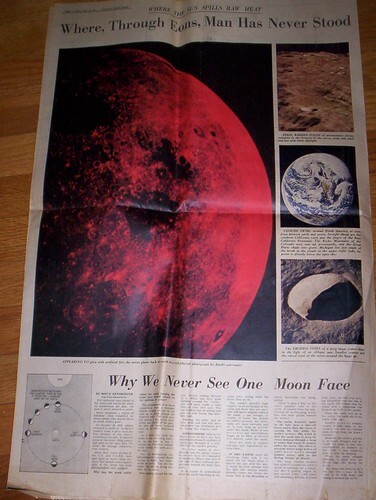 “If they have difficulty on the surface of the moon, there is nothing I can do about it. So I guess the question that everyone has in the back of his mind is how do I feel about having to leave them on the lunar surface. 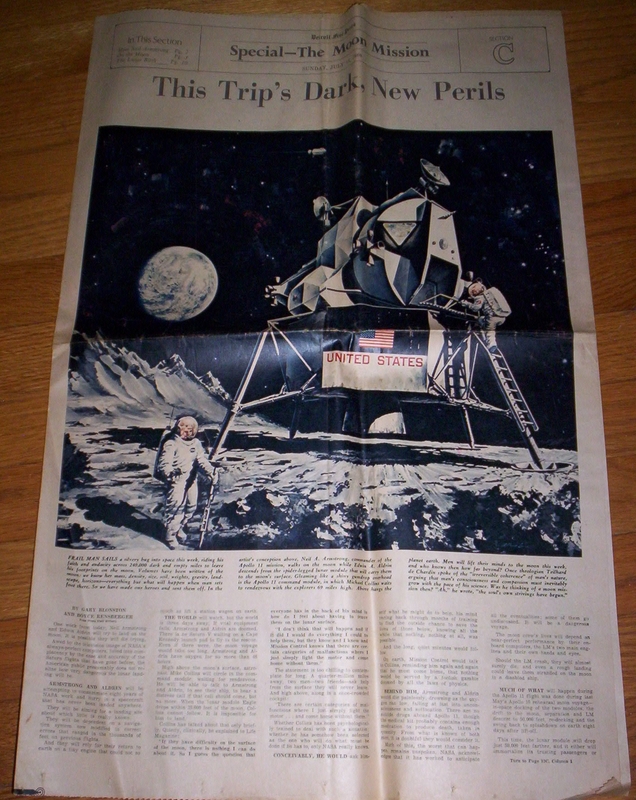 Page two is taken up by a long, anecdote-driven Neil Armstrong profile. 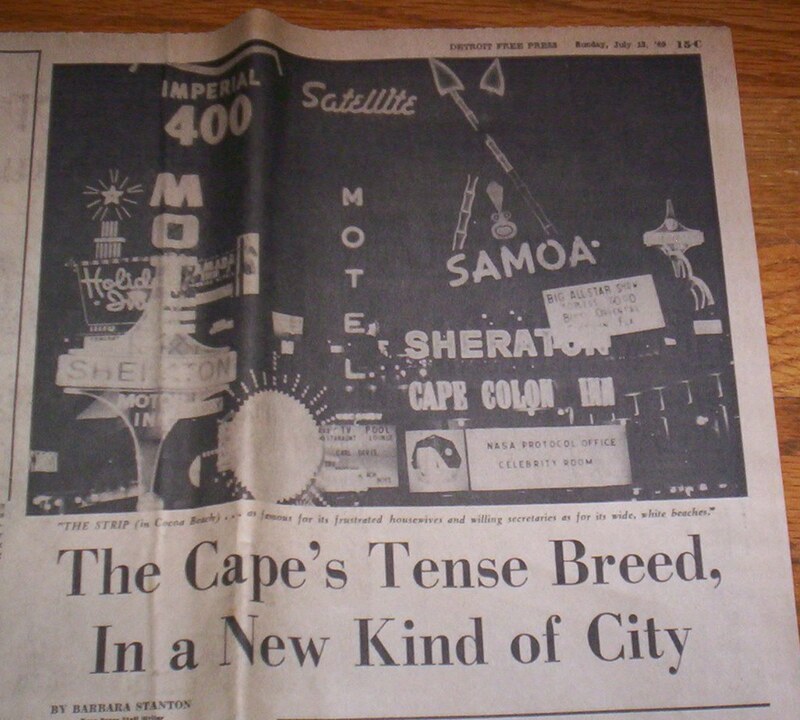 The two stories on page 15 are Blonston’s first-person account of watching a Saturn V rocket launch and a less-than-flattering look at NASA’s societal impact on Cocoa Beach, Florida. 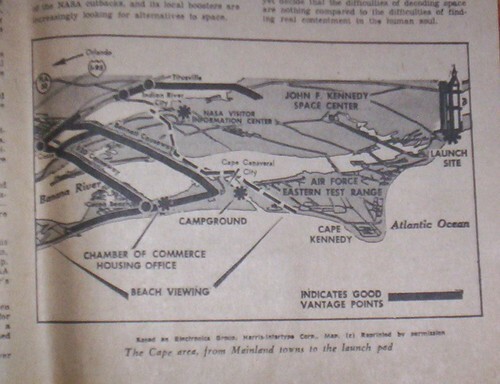 There’s also a drawing of the region showing the best sites for watching the launch which I think is kind of neat and reminds me of living in Orlando and driving down Route 50 to Titusville to watch space shuttle takeoffs. I wish I had the rest of this section, but discovering these four pages alone, along with the coverage of the first landing’s anniversary – has really stirred up some wonder. 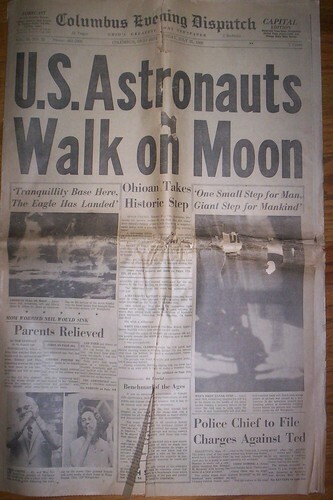 The Apollo 11 landing happened a year and a half before I was born. Apollo 17, NASA’s last lunar landing trip, concluded when I was barely two, which means I have no memories at all of the moon mission years.